It’s a goal, a practice and an accomplishment. Conserving energy, solar power, planting trees, healthy buildings, growing and eating local, and a culture of sharing help us lower our collective resource use to about 30% of the typical American household. It’s easier to do together than alone. As residents, we continually try to find ways to reduce, reuse, recycle and repurpose. From the way we design our buildings, to how we share everything from tools, cars, and household goods, we’re learning a lot. Green Buildings: We’ve designed and built houses which utilize the warmth of the sun and conserve heat during the long, cold winters. Passive solar design means orienting homes toward the south, and including large window walls on the south side. This lets in natural daylight, and heats the home easily when the sun is out. Windows are minimized on the north side, to keep out those cold north winds. Homes are also super-insulated. Each neighborhood was designed and built at a different time, but each represents state-of-the-art building techniques for that time. 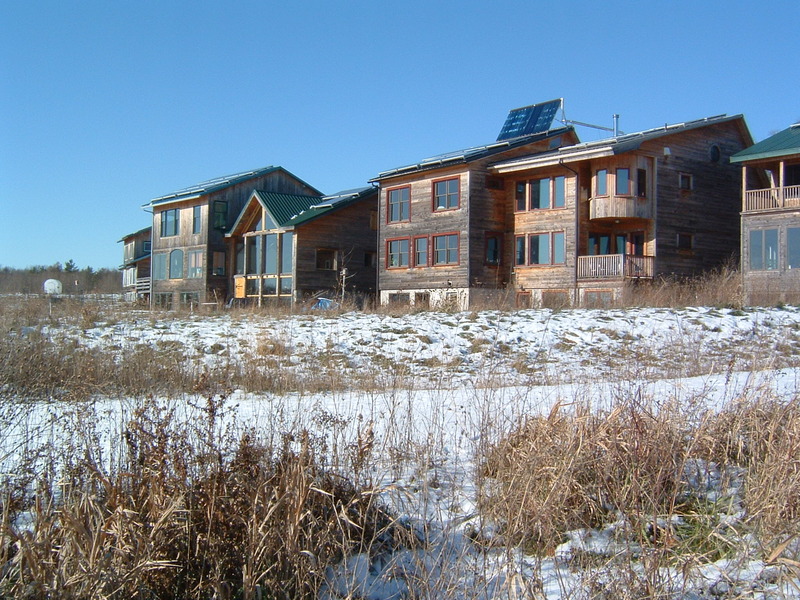 In FROG, built in 1996 and 1997, homes are passive solar, stick-built duplexes, with double-wall construction, and filled with dense-packed cellulose insulation. They have triple-glazed windows, and wooden trellises covered with vines provide pleasant shade in the summer. SONG homes, built from 2002-2004, are more customized than FROG homes, yet most are built from Structurally Insulated Panels (SIPs). Others are timber-frame construction and there is one straw-bale duplex. Fourteen out of 30 SONG homes have photovoltaic panels on their roofs. TREE homes take the concept of air-tight homes to a new level with the use of Passive House design. This design, thought by many to be the most stringent building code in the world, utilizes extremely tight air-sealing of the homes, and walls that are a foot deep, filled with insulation. Continuous fresh air ventilation is pre-warmed by an Energy Recovery Ventilator (ERV). This European design is very comfortable with no drafts, and the homes almost heat themselves by the occupants body heat. Solar Powered: Solar panels generate over half of our electricity needs. In addition to rooftop panels on SONG roofs, both FROG and TREE will have 50 Kw ground-mounted arrays. In TREE, this electricity will be used for the four-story Common House, with its 15 apartments. 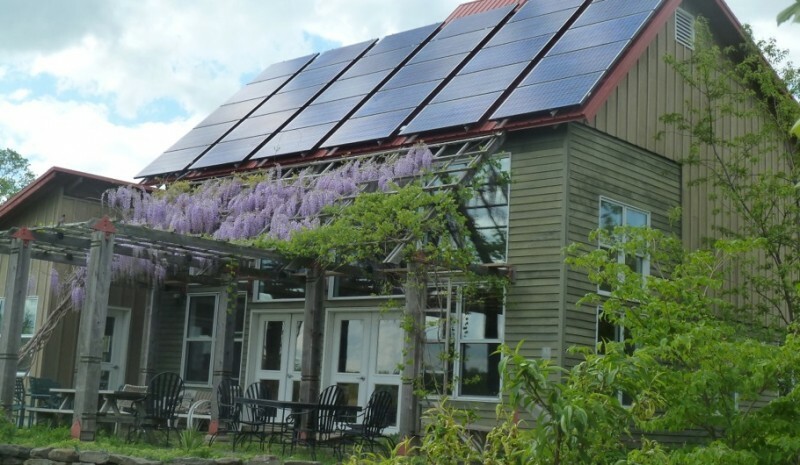 Most of the 25 houses in TREE will have both solar electric and solar hot water. For the 50Kw array in FROG, you can see this flyer as well as a detailed article about the process of building the system from Home Power magazine. You can also see live production data from the system and live electric meter data from the households. Its Fun to Share: A culture of extensive sharing includes easy access to carpools, re-use of electronics, clothes, toys and furniture, as well as shared video and book libraries. Our soon to be three Common Houses include shared children’s play areas, laundry facilities, offices, guest rooms, beautiful dining areas and community kitchens. A community woodshop, work-out room, sauna and swimming ponds are available to residents as well. A tractor and several mowers are owned by the Village for everyone’s use. Cutting Our Ecological Footprint by 70%: PhD student Jesse Sherry from Rutgers University found that the ecological footprint of EcoVillage Ithaca residents is 70% less than typical Americans. This means that people in our community use only about 30% of the total resources needed for travel, heat, electricity, food, water and waste. We’re glad that we can enjoy a high quality of life, while living more lightly on the planet. However, we’d like to continue to improve over time, and we’re eager to share what we’ve learned with others, as well as try new ways to conserve.